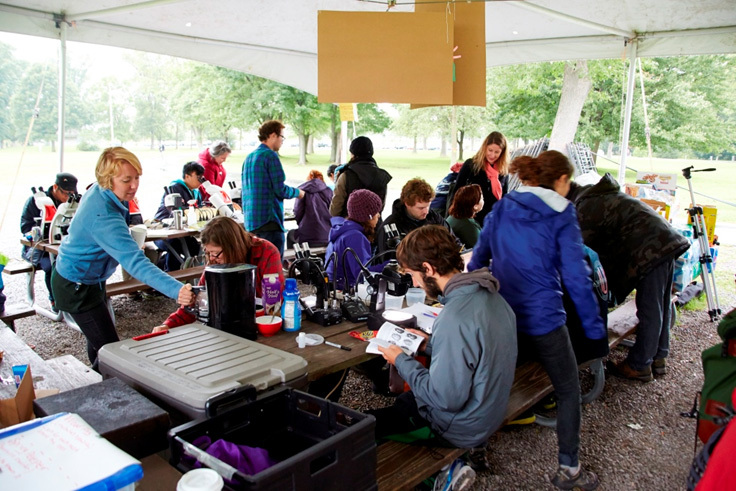 Home » Gallery "Onondaga Lake BioBlitz"
September 2014 - Nearly 450 species were identified by State University of New York College of Environmental Science and Forestry (SUNY-ESF) professors and students, and Onondaga Lake Conservation Corps volunteers, during a 24-hour Onondaga Lake BioBlitz, September 12-13. 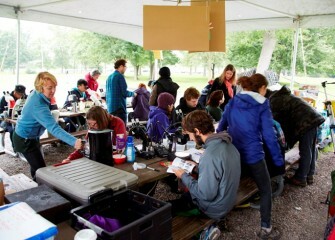 September 2014 - Participants worked from several bases of operations around Onondaga Lake, including this tent staffed by SUNY-ESF professors and students. 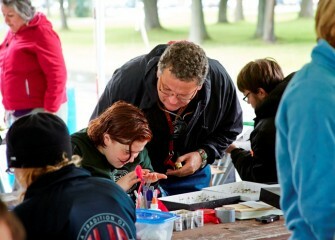 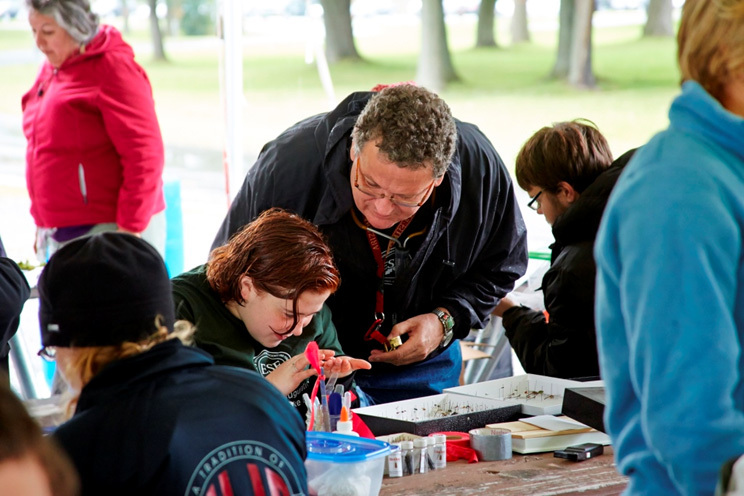 September 2014 - BioBlitz was part of the celebration surrounding the inauguration of SUNY-ESF’s president, Quentin Wheeler, Ph.D. (center), who is helping a student identify an insect. 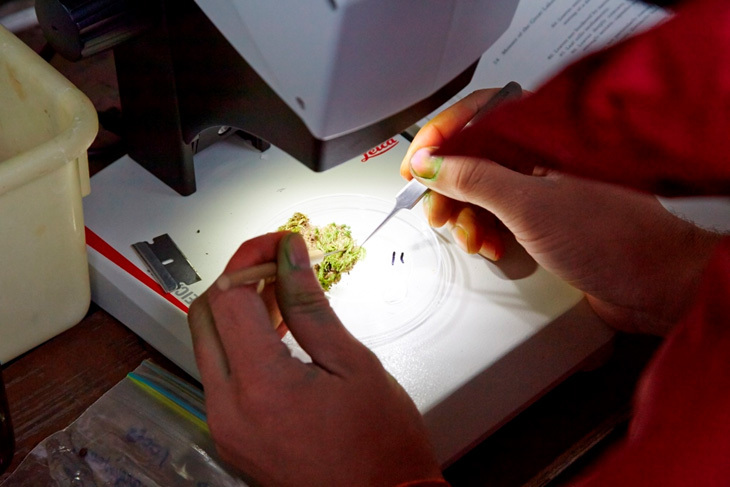 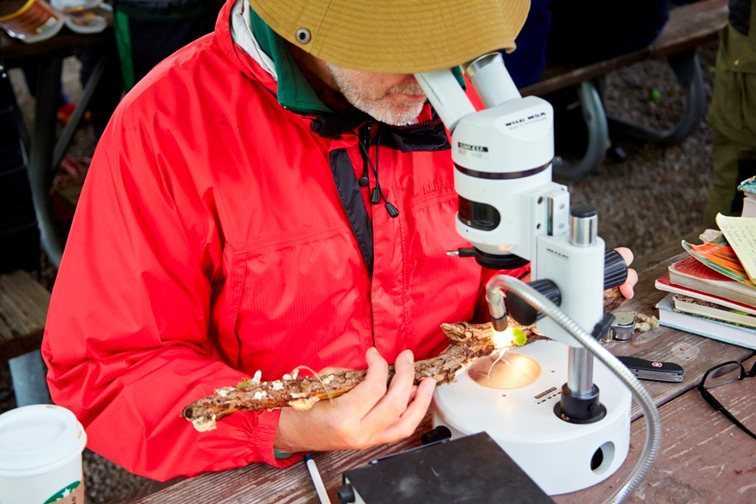 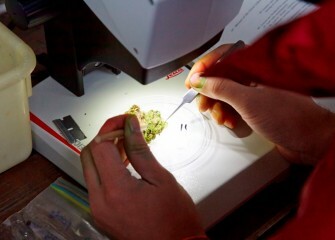 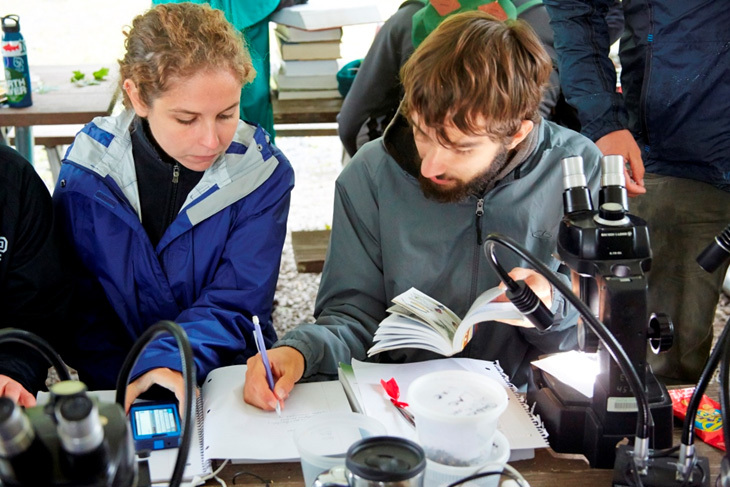 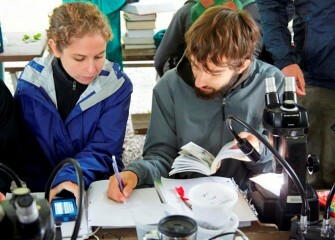 September 2014 - Microscopes aided in distinguishing among mosses and other samples collected during the BioBlitz. 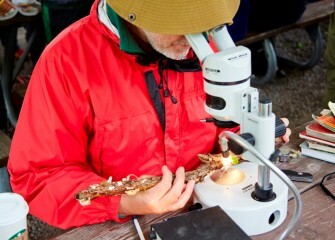 September 2014 - Observations were recorded and species identifications were uploaded to inaturalist.org, a live online tool used to tabulate findings. 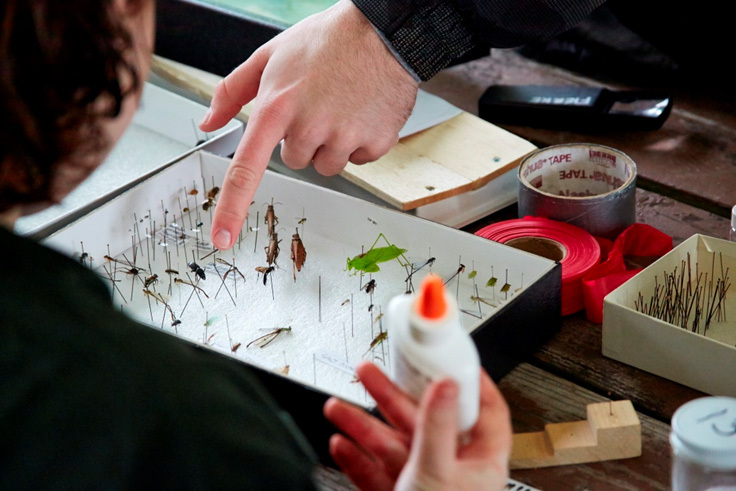 September 2014 - Community volunteers and SUNY-ESF faculty and students worked side by side to inventory and identify every species of plant and animal that could be found in 24 hours. 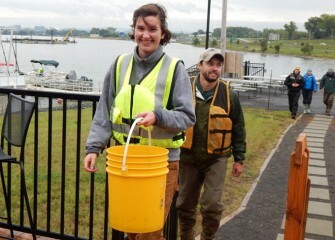 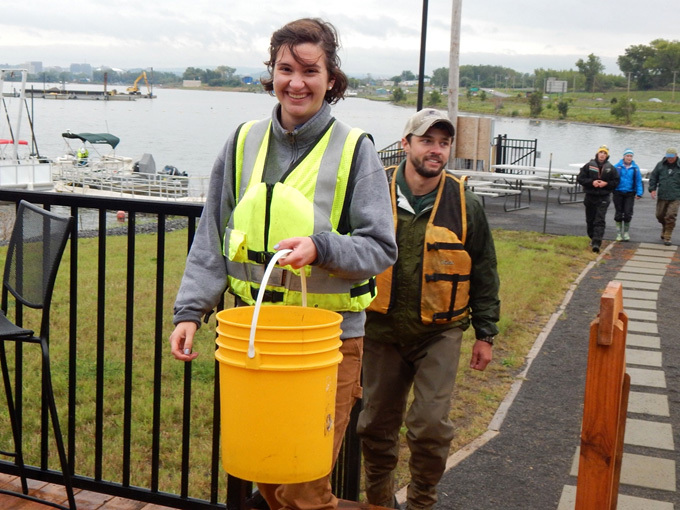 September 2014 - SUNY-ESF graduate students at the Onondaga Lake Visitors Center with fish collected from Onondaga Lake. 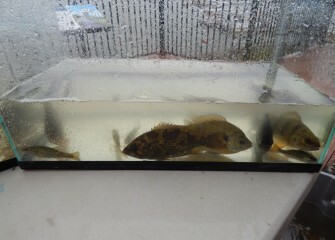 September 2014 - Fish were placed in temporary holding tanks. 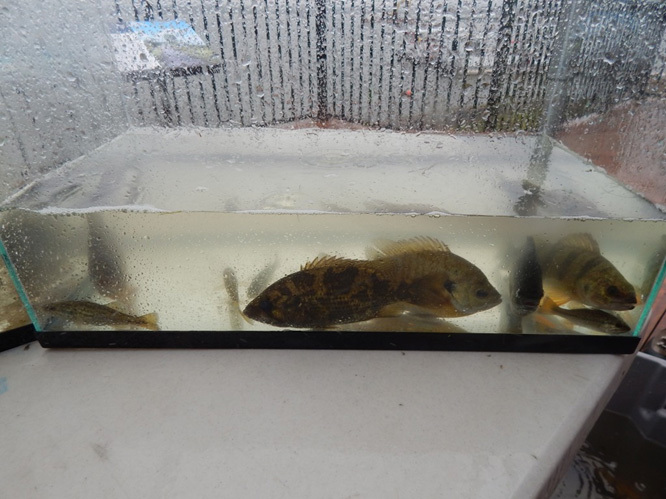 From left to right are a juvenile largemouth bass (corner), rock bass, two bluegill, a yellow perch, and another juvenile largemouth bass (small fish in bottom right corner). 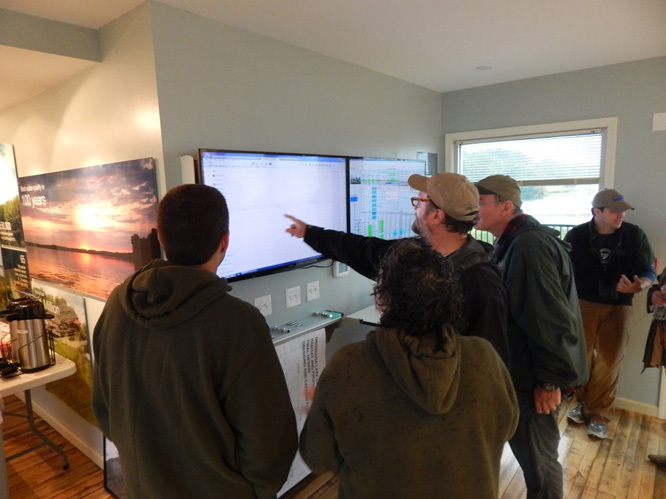 September 2014 - Inside the Visitors Center, experts and community members watch a live feed at inaturalist.org as species found during the 24-hour BioBlitz are recorded. 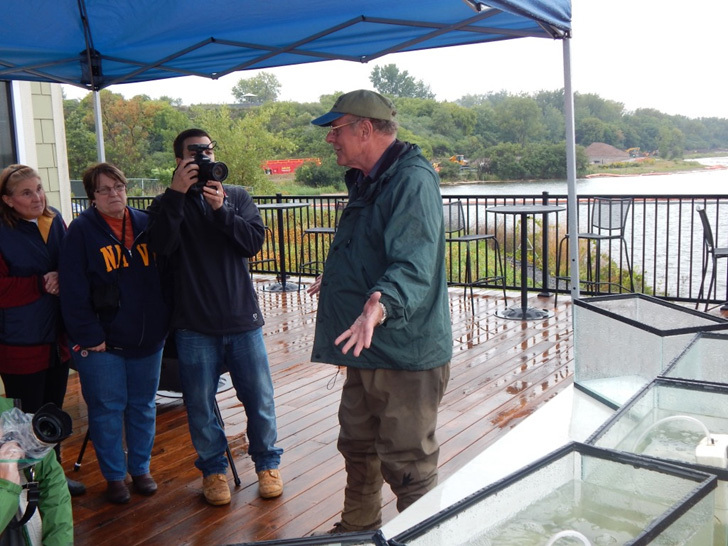 September 2014 - Participants listen as Neil Ringler, Ph.D. (right), fisheries expert and vice provost of research at SUNY-ESF, gives an overview of the fish communities in Onondaga Lake. 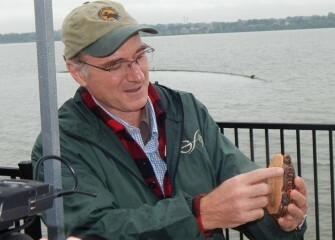 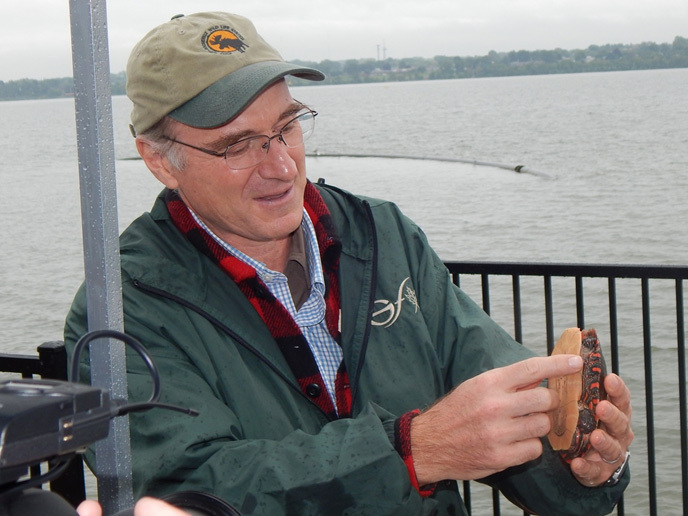 September 2014 - James Gibbs, Ph.D., professor of vertebrate conservation biology at SUNY-ESF, points out colorful markings on an Eastern painted turtle. 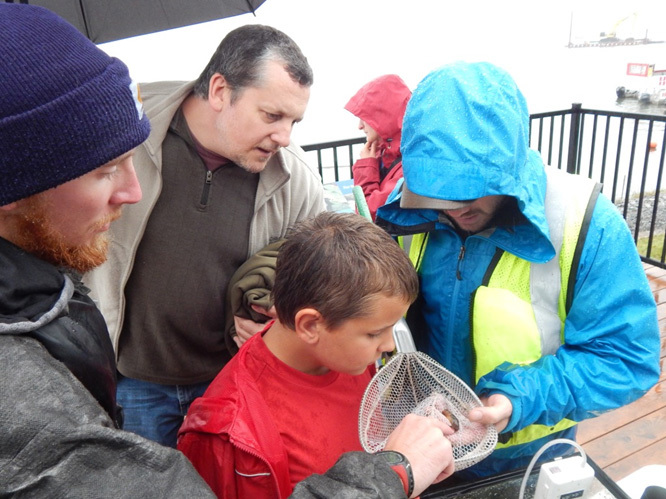 September 2014 - David Emerson (center foreground) came with his family from Oxford, NY, to participate in the BioBlitz. 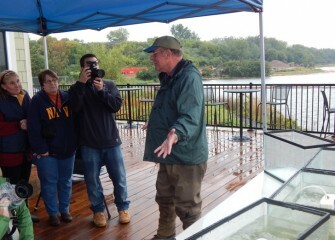 Here David learns about the characteristics of a tadpole madtom (a type of small fish) netted in the lake. 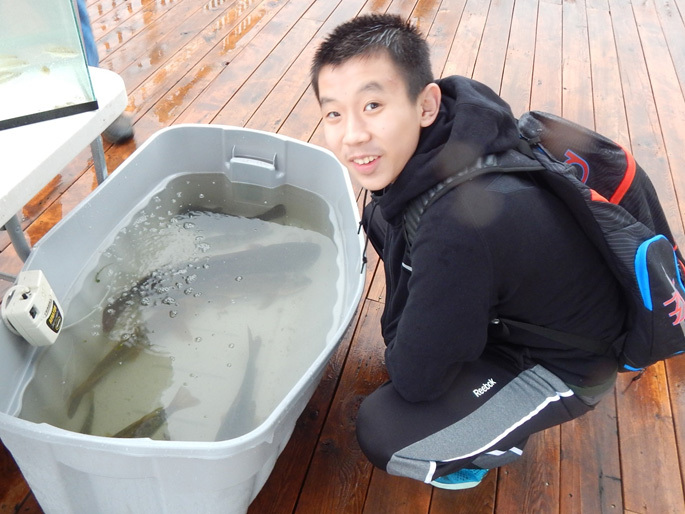 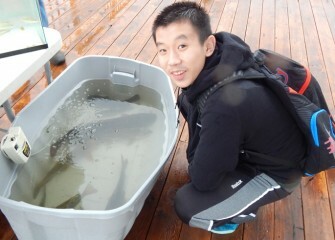 September 2014 - Onondaga Lake Conservation Corps member Josh Zhao enjoys observing some of the larger fish found in Onondaga Lake. 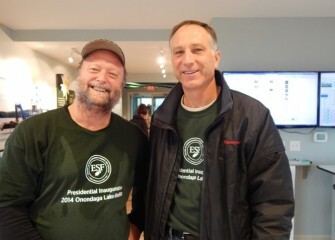 September 2014 - Donald Leopold, Ph.D. (left), distinguished teaching professor at SUNY-ESF and expert in biodiversity, organized the BioBlitz and also provided input to the design of the Geddes Brook and LCP wetlands, as well as the Onondaga Lake Habitat Restoration Plan. 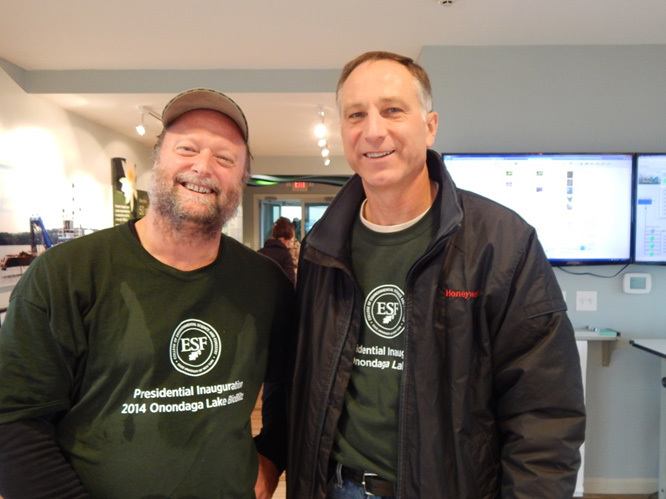 He is seen here with Honeywell Syracuse program director John McAuliffe.